Blind Dog Entertainment is a new production company, based in Arizona, created and headed by Jose Granados and Douglas Kondziolka. Don't know these names? How about "Don Juan and Miguel?" 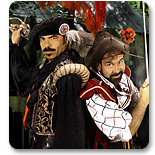 For almost a quarter of a century Mr. Granados and Mr. Kondziolka have brought these colorful characters to life at Renaissance Festivals across the United States, and in doing so have become the most sought after and highly regarded act in their field. Now they have founded Blind Dog Entertainment as another venue for their talents. Blind Dog Entertainment was formed to utilize and promote the talents of a developing Arts Community in the United States: Renaissance Festivals. These Renaissance Festivals, recreations of old English Marketplaces with a definite American flair, follow in the steps of the Chautauqua of the late 1800s and maintain many of the traditions of early 20th century American Vaudeville. Beginning over 30 years ago, now almost every major U.S. city boasts of its own Renaissance Faire. Although often viewed as local events promoting a sense of "Community Theater," there is also a nationwide "circuit" of professional performers and musicians, which comprise this unique artistic community. The entertainers and musicians who perform on the circuit of Renaissance Festivals and have achieved national recognition are also respected and embraced as part of each local community. Blind Dog Entertainment seeks to take advantage of this unusual talent pool, using and, again, promoting people who are well known and respected within these circles. Contrary to some popular belief, these artists do not all wear duct tape or fully "believe" that they live in Elizabethan times, but are indeed professionals seeking to keep alive American and European performance and musical traditions while adapting and evolving them to modern tastes and sensibilities.